She was used in Bornemouth for 25 years before being semiretired as a driver training vehicle. 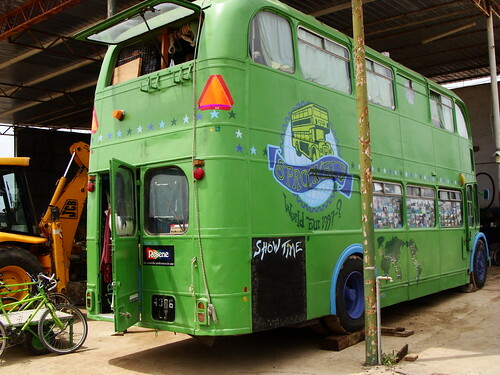 After completing over 1,000,000 miles on the South coast of England, the bus was fitted out as a circus bus. To cross borders with the bus we use a “carnet de passage” issued by the AA, with this we had no major problems. The cheapest diesel was in Iran where we filled the tank (144 litres) for less than US$2.OO. The last fill up in England cost US$130.00. The bus had to cope with extremes of temperature. To prevent overheating, Pascal Cornier, our French mechanic, fitted two fans from scrap Mercedes behind the upstairs radiators. Across much of Pakistan, the roads were so bad, our Dutch bicycles proved a faster mode of transport. Sometimes we even had to rebuild the road metre by metre in front of us. So far we’ve had five major sea crossings. The first one was on a container ship from Chitagong (Bangladesh) to Singapore. The bus was lashed to a 40ft flat rack container by steel cables. We had to build our ramp with scrap materials. It took us 12 hours and the bus nearly overturned when one side of the ramp collapse. The others crossing (Singapore/Freemantle(Oz) and Brisbane(Oz)/Auckland(NZ) were much easier as they were on a roll on/ roll off. From New Zealand to Chile the bus was also lashed onto a flat rack and we saw it being lifted by a crane onto the ship but in both ports we felt reassured by the competence of the workers. The last one, Caracas-Santo Tomas de Castillo was also an easy one on a roll on-roll off. The bus got stuck in soft sand in Thailand. After struggling for two days with jacks and wooden blocks, Roger Harrison (visiting at the time) came up with the idea of connecting the front and rear wheels with lorry straps, and so turned her into a 4 wheel drive. The main bearings broke down in Ipoh, Central Malaysia. The engine had to be taken out and rebuilt by two Indian mechanics. They were good but slow… It took 5 months. In the Australian desert, two tyres blew out with the heat, forcing us to travel 120km with three tyres instead of 4 at the back of the bus. On route to San Pedro de l’Atacama, high in the Chilean Andes,we set a new altitude record for a double decker bus of 3.100 metres. Lack of oxygen forced us to drive the bus at a maximum of 2 miles an hour which allowed us to exercise as we could hop in and out of the bus whiles driving along. In Panaachel, Guatemala, Due to road work, we drove 500m in 4 hours, rebuilding the road (or should I say the mud path) as we went along. It felt very good being back on tarmac.